From director Jason Mills who gave us the 2009 horror ABOVE US LIVES EVIL (a.k.a. They Came From The Attic) comes his latest horror effort 3 HOURS TILL DEAD a zombie film. The story is one we have seen done to death, a group of friends go camping out in the wilderness, away from the outside world for 2 weeks they are unaware of what has occurred. Travelling back from what must have been a very cosy two week camping trip going by the lack of bug bites and general dishevelment from sleeping rough, they run out of fuel (of course they do) and go seek help at a farmhouse. Once they start looking around they realise all is not well, if the blood all over the walls wasn't a dead giveaway already, they are soon overrun by 'passers' this films term for zombies. Naturally they all seek shelter in the very accessible farmhouse and as the friends numbers start to drop, will anyone survive this zombie apocalypse? We shall start off with what was good about this indie zombie flick, a nice new take on zombies where it would appear they only live for 3 hours and then they die. Presumably this is because they haven't eaten as no explanation is really given. Two types of 'passers', the slow ambling kind and the ones that could give Usain Bolt a run for his money. Decent enough sfx when it comes to gore but the slow 'passers' are about as scary as a sunflower. Thats the films plus points covered now lets dig into its weaknesses. Characters with no real story behind them to give you a likability to anyone. A partial explanation for the outbreak of zombies...sorry 'passers'. Why is a farmhouse in the middle of nowhere suddenly swamped by half a towns population? 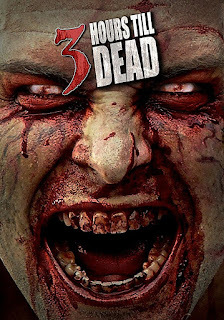 3 HOURS TILL DEAD had the right ingredients to have something unique to it, but this indie zombie flick is let down by too many factors, leaving you feeling underwhelmed and wondering what zombie film you should have watched instead.